Just as babies and grownups have different dietary requirements, puppies and adult dogs require food specific to their age group. Unlike babies, however, different puppies require different food depending on their size and breed. If your large breed pup is to develop into the massive dog it has the potential to be, you’re going to have to get its diet right from day one. Today, we’re going to be looking at some of the best large breed puppy foods to lay the groundwork for healthy joints and powerful muscles. When should my puppy start eating hard food? Can’t I just use an adult formula? How much food should I use per feed? According to an annual veterinary survey, Hill’s Science Diet is the No. 1 brand of dog food among veterinarians for feeding their own pets. Veterinarians with puppies choose Hill’s Science Diet Puppy Chicken Meal & Oats to feed their newborn best friends. Here’s why. As a puppy develops, so does its coat, which is why you should be sure to feed your puppy a formula that is high in omega-6 fatty acids. Omega-6 fatty acids protect against skin conditions and ensure your dog’s coat comes in thick and shiny and will keep it so as the years go by. Owing to their size, large dogs tend to develop joint issues as they age and their frame finds it increasingly difficult to support their weight. In order to minimize the risk of your large dog’s joints caving under the pressure of his or her weight as they age, you should fill their bowl with Hill’s Science Diet Puppy Chicken Meal & Oats, which contains optimal levels of calcium for controlled bone growth and sustained bone density. Dog foods manufactured in China or other Asian countries generally don’t meet the health and safety standards set by United States authorities, so you can’t be certain that such formulas will do everything they promise to do. Hill’s Science Diet Puppy Chicken Meal & Oats is made in the USA, so you can be certain it contains high-quality ingredients. Puppies are prone to digestive issues, so it’s important to find a dog food that doesn’t exasperate them. Hill’s Science Diet Puppy Chicken Meal & Oats is made with easy-to-digest ingredients to lower the risk of constipation and diarrhea. 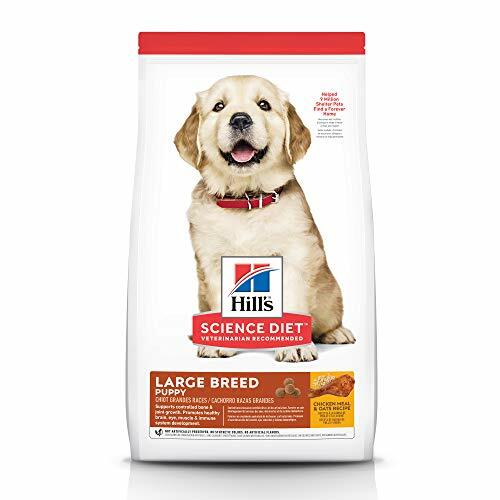 A common complaint made by those who regularly feed their dogs Hill’s Science Diet Puppy Chicken Meal & Oats is that the formula is a lot greasier than competing formulas. This isn’t a major issue, but you should expect to find yourself cleaning your dog’s bowl more often than you would using a different brand of dog food. A lot of large breed puppy food manufacturers emphasize nutrition in denegation of a dog’s right to a tasty meal. Fortunately, EUKANUBA is not one of those manufacturers. While the brand’s Large Breed Puppy Chicken promises 100% complete and balanced nutrition, it is also virtually guaranteed to delight your puppy’s taste buds and lay the groundwork for a healthy appetite in adulthood. DHA contributes to brain development and function and makes for more attentive puppies, so this formula is a great choice for those planning to have their dogs trained. This formula boasts a unique fiber system of natural beet pulp and prebiotic FOS. Together, these ingredients enhance nutrient absorption while promoting the healthy functioning of your dog’s bowels and digestive system. As you probably guessed from its name, EUKANUBA Large Breed Puppy Chicken utilizes chicken as its primary ingredient. This means it is high in animal protein, which is essential for muscle growth and weight gain, particularly in large breed dogs. 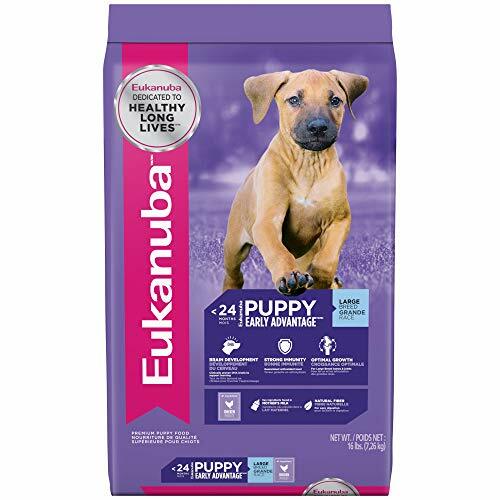 EUKANUBA Large Breed Puppy Chicken contains optimal levels of both omega-3 and omega-6 fatty acids. When consumed together, omega-3 and omega-6 fatty acids keep skin conditions at bay and will keep your puppy’s coat shining brighter than bright throughout puppyhood. 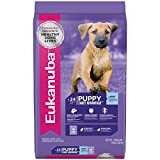 Although EUKANUBA uses real chicken as the primary ingredient of its Large Breed Puppy Chicken, the formula also includes chicken by-product meal. By-product meal is held in pretty low regard by veterinarians and dog food experts as it is composed of whatever is not used in the manufacturing of more savory meat products, meaning it can contain, and likely will contain, claws, feathers, and even beaks. Formula includes chicken by-product meal. Wellness has long been one of the most popular manufacturers of dog food among dedicated dog owners. While its formulas may cost a little bit more, Wellness brings to the table a wealth of experience and a history of excellence, which its Large Breed Complete Health Puppy Deboned Chicken, Brown Rice and Salmon Meal Recipe formula serves only to strengthen. Large dogs aren’t quite as active as their small breed counterparts, but they still require an energy-boosting diet, especially in the early stages of their development. Wellness Large Breed Complete Health Puppy Deboned Chicken, Brown Rice and Salmon Meal Recipe boasts controlled energy intake to ensure your puppy gets the energy they need when they need it, which allows for paced growth. Although it isn’t advisable, there is nothing wrong with feeding your adult dog a formula that includes artificial colors or preservatives every once and a while. However, you definitely want to avoid feeding your puppy such formulas as they will warp its taste buds and render more natural recipes unpalatable. 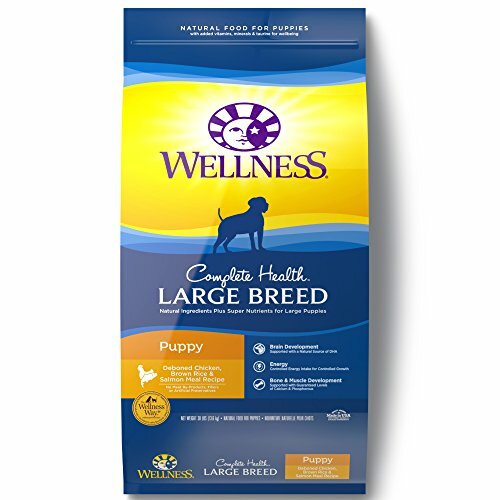 Wellness Large Breed Complete Healthy Puppy Deboned Chicken, Brown Rice and Salmon Meal is made using 100% natural ingredients yet is as rich in flavor as it is in nutrients. As well as being devoid of all artificial flavors, colors, and preservatives, Wellness Large Breed Complete Healthy Puppy Deboned Chicken, Brown Rice and Salmon contains no meat by-products, so you can be certain your puppy is eating as well as you are every mealtime. Most puppy foods feature small kibble in order to minimize the risk of choking or dental issues. Small kibble is great for small breed puppies, but more often than not it leaves large breed puppies unsatisfied and fails to prepare them for the rather sizeable kibble of large breed adult food. This formula from Wellness features larger kibble, ensuring every meal fills your puppy’s stomach while strengthening its jaw. Wellness Large Breed Complete Health Puppy Deboned Chicken, Brown Rice and Salmon is not a grain-free formula. Some breeds are less tolerant of grains than others and some dogs within those breeds may be completely allergic to them. A diet of grains could very well result in digestive issues for your puppy, so we recommend you consult your veterinarian before committing to this particular Wellness formula. 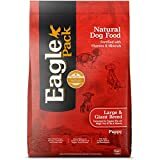 One 30-pound bag of Eagle Pack Large Breed Puppy will set you back quite a bit less than a 30-pound bag of food from a better known brand, but that doesn’t mean it is inferior. In fact, Large Breed Puppy is, in many ways, more impressive than the products of Eagle Pack’s competitors. Below, you will find just some of the reasons why that is. Most dog food formulas include just one source of animal protein, if they feature animal protein at all. Eagle Pack’s Large Breed Puppy, however, boasts dual animal proteins. With a recipe that includes both lamb and chicken meal, this formula promotes optimal and safely paced muscle and skeletal growth. Puppies have a greater risk of falling ill than an adult dog. Even in large breed pups, any infection or disease contracted in the days and weeks after birth could prove fatal, which is why it’s essential to choose a formula that will aid in the development of your puppy’s immune system. The Large Breed Puppy formula features Eagle Pack’s complete vitamin and mineral package, which will lay the foundation for a powerful immune system throughout puppy and adulthood. Like a number of the formulas we have looked at so far, Eagle Pack Large Breed Puppy is rich in DHA, the aforementioned fatty acid that is found in fish oil and mother’s milk. With this formula and others like it, you can be certain that your puppy will continue to get the nutrition needed for healthy development of the brain and eyes long after weaning. 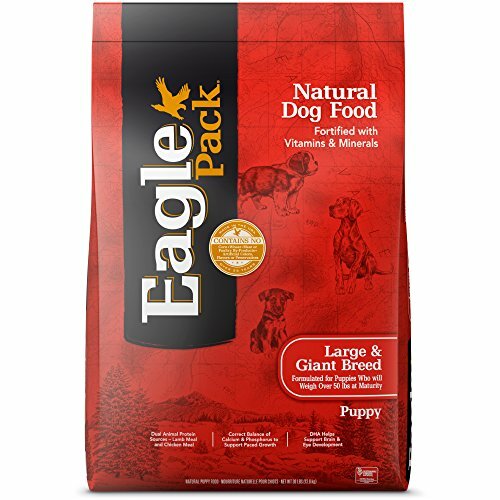 The lamb and chicken meal featured in Eagle Pack Large Breed Puppy is derived from real chunks of meat as opposed to meat by-product. Similarly, this formula contains no corn or wheat, which many budget dog food brands tend to rely on as filler ingredients, padding out their recipes while adding little, if any, nutritional value. The dual animal proteins which Eagle Pack so proudly touts in the advertising of this formula make it unsuitable for less active breeds. Labradors and Siberian Huskies, two large breeds that require a high-energy diet, will benefit immensely from being fed on this formula, but in more relaxed breeds, such as Basset Hounds and Bullmastiffs, it will likely result in unhealthy weight gain, abnormal joint development, and even early-onset arthritis. With controlled levels of protein, fat, minerals, and calories, Diamond Naturals Large Breed Puppy is one of the most versatile large breed puppy formulas on the market today. It has long been a favorite of owners and breeders alike and is likely to prove just as popular with your puppy. Because of their size, large breed dogs tend to suffer from joint issues as they age, particularly if they are not fed a calcium-rich diet during their puppy years. Diamond Naturals Large Breed Puppy promises optimal skeletal growth through high doses of calcium and phosphorus. Phosphorus also aids in the management of waste and the repairing of tissue and cells, so this formula will concurrently minimize the risk of digestive issues and strengthen your puppy’s immune system. As well as being rich in calcium and phosphorus, Diamond Naturals Large Breed Puppy is high in the chemical L-carnitine. L-carnitine wards off unnecessary weight gain by converting excess fat into energy, which will give your puppy a leaner body and reduce the stress on his or her joints. L-carnitine has also been known to reduce the risk of cardiovascular disease in large breed dogs. Diamond Naturals Large Breed Puppy boasts balanced levels of omega fatty acids to ensure your puppy develops a healthy coat, one that continues to shine its brightest throughout adulthood and well into old age. 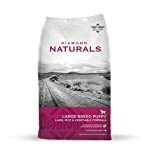 Diamond Naturals Large Breed Puppy is absolutely loaded with antioxidants, which are important for dogs of all ages, but are particularly crucial during puppyhood and old age as they serve to minimize the damaging effects of free radicals. Free radicals are a by-product of metabolism and when not properly confronted can contribute to the premature deterioration of cells. 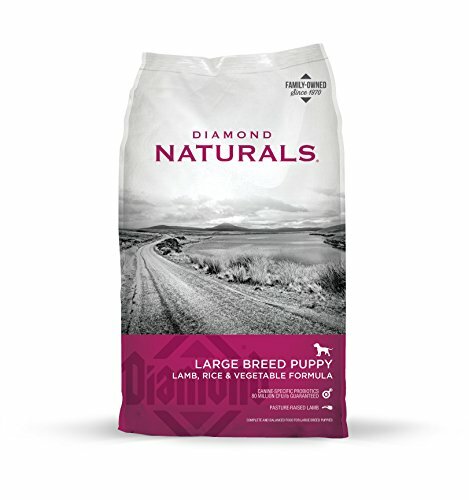 Diamond Naturals Large Breed Puppy is not a grain-free formula and might give rise to digestive issues. We advise that you keep a close eye on your puppy after introducing this formula into its diet to ensure their bowel movements remain regular. Adult dogs have a greater tolerance for lackluster formulas and subpar ingredients and are able to digest filler-laden foods – when served sparingly – without much issue. Puppies, however, are far more delicate and require carefully formulated recipes in order to lower the risk of constipation, lethargy, queasiness, and vomiting. For this reason, you should be sure to buy your large breed puppy food from a respected manufacturer, such as Wellness and EUKANUBA. Generic brands of dog food, while less expensive, will likely make your puppy ill and could conceivably cost you hundreds of dollars in vet’s bills in the long run. You should take your puppy’s breed into account when searching for the perfect puppy formula. Oftentimes, it is not enough to choose an unspecified large breed formula, as different large breeds have different dietary requirements. Energetic large breeds need protein-rich diets from the moment they are ready for hard food, but such a diet will leave less active large breeds overweight and miserable. If you decide to feed your puppy dry food, you should search for a formula that has appropriately sized kibble. Large breed puppies require their kibble to be a little larger than the kibble used in formulas for small breed puppies as it allows them to strengthen their jaws, but you don’t want to feed them kibble that is so large that they might damage their teeth or choke. DHA is something that has come up again and again in this article. Short for docosahexaenoic acid, DHA serves to sharpen the mind and promotes clear eyesight, which is why veterinarians recommended serving your dog, be it small or large breed, a formula that is high in DHA from the moment he or she is ready for solid food. If you have any older dogs in your care, you should switch them to a DHA-rich formula if they are not already on one as they are at greater risk of cognitive defects and loss of eyesight than their newborn counterparts. If you own a puppy and mother pair, you are likely wondering at what point you should move the puppy on to hard food. There is no set answer, but most breeders and veterinarians would suggest introducing solid food to your puppy’s diet at 3 ½ weeks in the form of puppy mush. By the time your puppy is seven weeks old, they should be eating only solid food. If you already have a bag of adult dog food in your pantry, you’re probably going to be tempted to use that to feed your puppy rather than dropping more cash on a puppy-specific formula. We understand that you don’t have an endless supply of money to spend on dog food, but if you want your large breed puppy to get the nutrition it needs to reach its full size and potential, you absolutely have to feed it a designated puppy formula. Feeding any puppy, however large it may be, adult dog food will almost certainly make it ill.
Because puppies develop so rapidly, its essential that you stay on top of your puppy’s feeding schedule and ensure it has enough food to keep it warm and active throughout the day. A puppy should be fed no less than three times a day and no more than four times a day. Avoid overfeeding your puppy, no matter how much they beg for another bowl of your chosen formula. We know it can be challenging to ignore those whines, especially when you’re trying to watch television, but just remind yourself that by refusing to give in you are protecting your puppy against joint pain in later life. A rigid feeding schedule will do wonders for your puppy, but you have to get the portions right if you want to see optimal growth. For puppies, even large breed ones, smaller meals are preferable. This is because smaller meals require less energy to consume and won’t put as much strain on your puppy’s still-developing digestive system as a larger serving. Try feeding your puppy a ¾ cup of puppy food three times a day and monitor their progression. If you think they could benefit from an extra feed, add a fourth ¾ cup of puppy food to their daily diet, but, as we stressed in the previous answer, do not go beyond that. Because they have such sensitive digestive systems and require specific combinations of specific nutrients, puppies should never be fed on generic dog food. Generic dog food manufacturers tend to pad out their formulas with filler ingredients and by-product meal as a means of keeping costs down, so while a can of store-brand puppy food might save you some money, it won’t do your dog much good. Our advice is to resign yourself to spending $50 on a bag of quality puppy food from a reputable brand. The chances are you won’t actually end up spending quite that much on your chosen formula, but setting yourself a budget of $50 will allow you to shop comfortably without price having the final say over the formula you purchase. Nobody ever said raising a large breed dog was going to be easy. Or, if they did, they were wrong! Owning a large breed dog from its birth through to its old age requires unrelenting dedication and it all starts with a quality large breed puppy food. Wellness Large Breed Complete Health Puppy Deboned Chicken, Brown Rice and Salmon Meal Recipe has long been high on our shopping list. With no meat by-products and controlled protein and energy, this formula is among the most versatile large breed puppy foods on the market and is a great choice for those who own two large breed puppies of separate breeds. It will ensure both dogs grow to their full size, at which point you can switch to Wellness’ Complete Health Adult formulas!